We’ve all been there before – every three, six, nine, or twelve months you wander into a sports store knowing it’s time you trade out your ol’ reliables for a new pair of running shoes. Maybe your last pair of running shoes were just shy of perfect; maybe they were the greatest instance of buyer’s remorse you’ve ever felt. Either way, choosing the right running shoe can be a stressful experience if you don’t know what exactly you’re looking for. Health Fitness Revolution broke down the essentials of choosing the right running shoe for your gait. Arch Type: The type of arch you have is indicated by the part of your foot that connects the heel of your foot to the toe. Anatomically, everyone has an arch but depending on how you stand, that arch may not even look like it touches the ground is as plainly visible like a full paw print. – When stepping out of the shower, step onto a plush bath mat for about five seconds before stepping off. – If convenient, take a barefoot stroll in the sand or even in the topsoil of your garden. – Artsy? Paint the bottom of your foot and step on some paper. Voila! A new masterpiece and you’ve got your arch type. Be sure to wash off or slide around in layered paper towels before walking around your house or the studio. Now that you’ve got an image of your arch type, it’s time to determine what kind of arch you have. 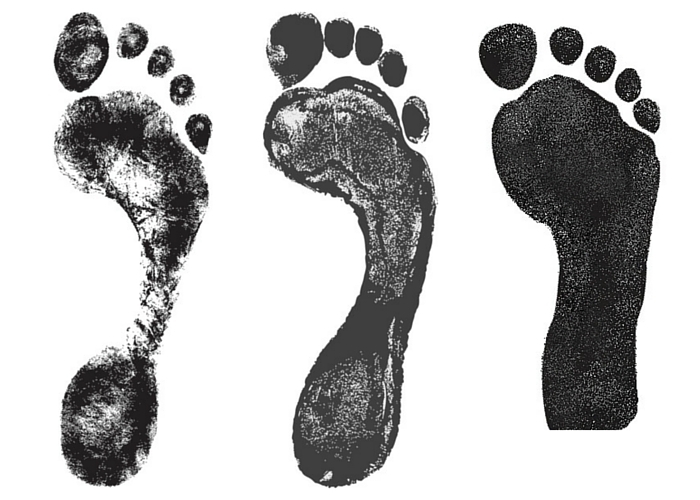 While there is some gray area and might fall in-between, there are three types of arches your feet could fall into. Note: High arches tend to look as pictured in the leftmost image, but extreme cases may have a nonexistent arch, where the “line” connecting the ball and heel of the foot isn’t visible. Flat arches, conversely, can be so extreme as to not even have the little curve between the ball and heel of the foot, where the foot may even takes on an oval shape without the concavity of the arch. In extreme overpronator (see below) cases, the arch may fall so flat that it protrudes off the foot and appears convex. Supinators tend to have higher arches and will have feet that roll out. Supinators are also referred to as underpronators. The trouble with supinators is because their feet aren’t rolling in to retain proper shock absorption, shock impact will be sent straight up the shins and hips, which can lead to shin splints and general joint pain. Neutral runners are in the healthy in-between of the supinator and over-pronator. There is usually proper shock absorption through mild pronation without overt stress on being placed on the roll of the foot. Overpronators tend to be flat-footed and when stationary, tend to have their feet and ankles roll inward. Overpronators need to be aware that excessive rolling of the foot could lead to stability issues and ultimately twist the muscles in the foot, ankle and shin and may even lead to pain. So What Kind of Shoes Do I Need? Overpronators do well with Stability or Motion Control Shoes. Because overpronators roll too heavily inward and are susceptible to foot injuries and tears, stability/motion control shoes are designed to support the foot’s natural roll and guide it away from excessive rolling. Supinators will find Cushion Shoes to their liking. As supinators tend to have issues with pronation (and by extension, shock absorption), cushioned shoes will help take in some of the shock impact. Note: cushioned shoes are not necessarily cushioned in the insole as much as they are in the midsole, so pushing your hand into the insole will rarely determine the level of cushion. Always put your feet in the shoes and do a light jog around the store. They should feel plush. Some cushioned shoes may be structured in the midsole to provide arch support. Neutral runners will vary. Many runners enjoy the feeling of cushioned shoes as many find the stability feature in motion control shoes to be overbearing while going through the running cycle. There’s a lot more variety to a shoe than gait and arch type, such as minimalist vs. maximalist shoes, road running vs. trail running, cross trainers v. running, etc., so stay tuned!